– First, we took the fresh 2011 census data and our census tract boundary set, mashed that up with several years’ worth of grow operation addresses, and created a map showing grow house rate by census tract. 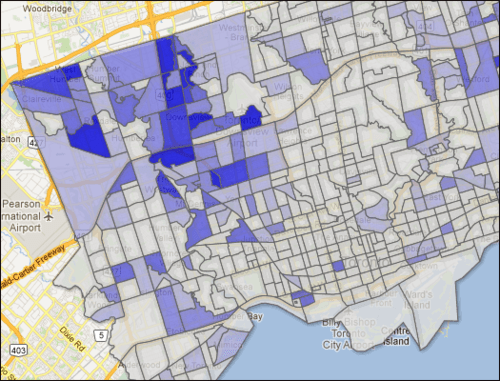 If you have the ability to count points within a polygon (Leslie showed me how to do this) it opens the door to interesting off-the-grid uses for census data. This entry was posted in Uncategorized and tagged maps, toronto. Bookmark the permalink.